Our annual member reward program rewards your loyalty and enables us to remain a vibrant cultural center. Since this program began in 2005, we've enhanced the lives of readers in our community through the 2 million books put in their hands, 1500 author events produced, $200,000 raised for Peninsula schools and non-profit organizations and $3 million we've collected and paid in sales tax. None of this would have been possible without our nearly 5000 Literary Circle Members. 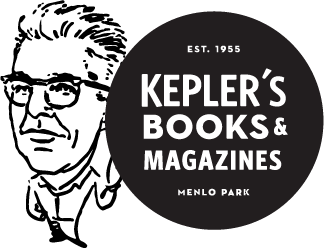 All members earn $10 toward their next purchase for every $100 spent on books, and receive invitations to quarterly member sales. Other member benefits personal concierge shopping service and more! 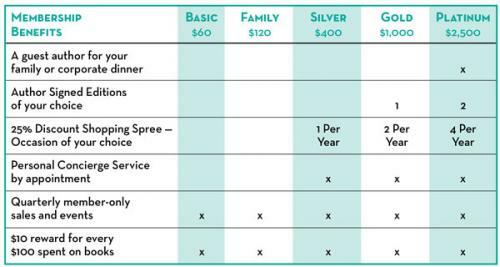 Look at the chart above and select the member level that is best for you. If you value a space to meet, talk about ideas, hold a book in your hands and listen to great thinkers present their work, then please join, or renew your membership today. Please note your membership is not tax deductible.